While we wait patiently for the pre-order date (which is just over two weeks away, in case you were wondering) you may want to take a gander at more images of the Cliq. What we have here is the blue version (funny, I thought that went to the wayside) of the Cliq. Mobile Review couldn’t get into the software because there is no place to sign up for a Motorola ID… yet. Head on over to read the short details on the Motorola Android phone and leave your thoughts in the comments! GOD if they had just put a Different Processor in the Thing and bumped up the Mem I’d REALLY be Excited!!! ARGghhhh! The more I see this phone, the more I want to pass. It’s basically a g1 with motion blur, buuuuuut motion blur is going to be distributed to rooted phones soon. So I will pass. What Galen20K said. I like the form factor and all, but why couldn’t they have kicked it up a notch. Then it would have been worth their $199 price point. Will probably wait until first quarter before getting a new phone. Funny how that works, right? I thought about it too, since it had a *small* bump in specs compared to the G1/myTouch… but the more I think about it and the more I read, the more I think I’ll pass. 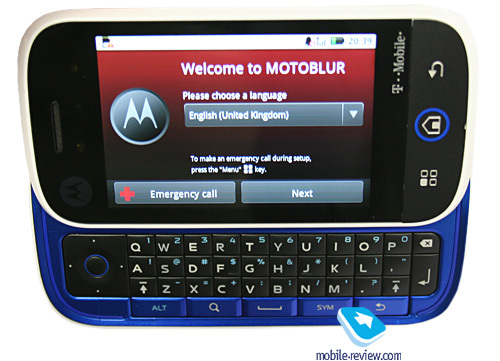 I don’t want MotoBlur anyhow, I just want better hardware! Speaking of G1v2, anyone read anymore about it? I read in other places where a few have suggested that the Cliq might actually be the G1v2? Not only does this not have anything special as compared to the G1 released over a YEAR ago, T-Mobile dropped the ball with pricing on this thing. It’s going to sell for 150 EURO unlocked, no contract and 1 EURO with contract. 150 EURO is ~$220, so I wonder is T-Mobile USA giving you just $20 worth of subsidy on this phone for a 2 DAMNED YEAR contract? I was also thinking about getting the cliq for myself, but once I saw the price and that the features are not really all that great… I’m going to stick with my rooted G1. I can keep playing with that until something worth my money comes out.. Get with it T-Mo. t-mobile has been lacking in processors they put in there phones from the beginning wtf!! t-mobile!!! is it to much to ask for a capable phone that doesn’t freeze due to crappy processors and better memory!!! i’m thinking of switching from t-mobile i’ve been with them for over 6 years and i’m still waiting for a phone that tops the market. i ended up getting a new tmobile iphone from germany and this(along with their great customer service) is the only reason i still have tmobile. but i’ve been waiting for 6 years to have a phone with no problems where is it tmobile!!! !